RHS flower show season is here! At time of writing, the RHS Malvern Spring Festival is just a day away and the RHS Chelsea Flower Show is opening on 22nd May in a couple of weeks’ time – buzzing honeypots for those seeking ideas and inspiration for this year’s fresh summer planting schemes. Dip a toe into last year’s trends over at our RHS Show Garden Designs Pinterest board. Then it’s to Chatsworth, Harlow Carr, Hampton Court, Tatton Park, Rosemoor, Wisley and back to Malvern for the Autumn Show in September. Such horticultural havens tick so many boxes for gardening fans. Competing show gardens push the boundaries of contemporary garden design, with roots in the latest popular planting looks as well as often nodding to eclectic influences – historical, culinary, international, meteorological, even political. Garden celebrities can be seen in the flesh, sharing views and tips in theatre-style talks and televised chats. To top it all, with their own domestic garden scheming in mind, visitors can fill their boots with plants and garden accessories to disperse back home from hundreds of specialist stalls. Whether influenced by a day out at one of the big flower shows, watching Gardener’s World and Chelsea pan out on the telly, or just a trip to a local garden centre, it’s time to form ideas for this year’s summer displays. Try considering a planting theme as a whole first and then focus on separate areas – borders, walls, arches, planters and, our chosen zone here, window boxes. Paying special attention to the varying elements whilst keeping a wider, pre-considered overall effect in mind will pay dividends. On-the-face-of-it simple pieces of planting kit, really ‘wow’ window boxes need to be well considered. Of course, the window box itself must be super strong, long lasting and very safely fixed but it can also be sympathetic in design to the architecture around it, effectively enhancing a building rather than acting as an afterthought, a ‘stuck-on’ feature. 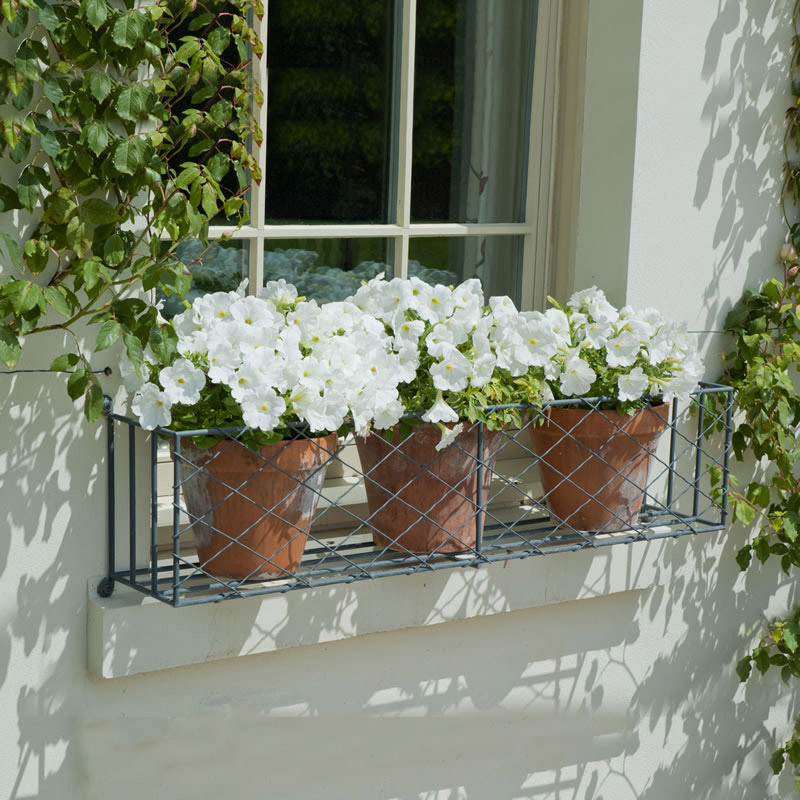 Garden Requisites’ window boxes are designed with varying architectural styles in mind – ‘Wirework’ has a galvanised steel mesh, ‘Ironwork’, a broad X design, ‘Crescent’, crossing curves which sit beautifully with heritage properties, and ‘Contemporary’ with a rectilinear grid pattern, good for more minimalist styles. north-facing, south-facing…?, style – cottage, townhouse, modern, period?The simplest of planting in repeat can often be the most arresting. Mono plant clipped topiary – balls, cones, pyramids or columns. Buxus sempervirens (Box), dwarf Conifers, Ilex crenata, dwarf Hebes, Ferns and even ornamental Cabbages can strike a pose on their own or underplanted with trailing ivy. Go green! For more eye-catching colour ways, start the year with spring bulb brights then maybe more subtly flowering Heathers and Lavender, or go blousy and trad with Geraniums, Pansies through to bright trailers – Verbena, Anthirrhinum, Erigeron and Nasturtium. Unless in a cottage garden environment, sticking to just a couple of colours that sync with the wider garden’s planting can make more of a statement. Mixing Mediterranean herbs – Rosemary, flowering Thymes, Marjoram, purple, common and variegated Sages, Oregano, Mint and more – can also make for a delightful single window box with the possibility of opening the window to snip culinary herbs for the cooking pot. For more summer window box inspo, do leaf through our Pinterest board on the very subject – Summer Window Boxes. We do hope we’ve helped prompt a flower show foray or at least some tuning in to Chelsea Flower Show when it soon appears for a few nights on our TV’s. You never know what you’ll spot that will form the kernel of an inspired planting scheme of your own!